The Primer is back with another odd, forgotten series: Otherworld. 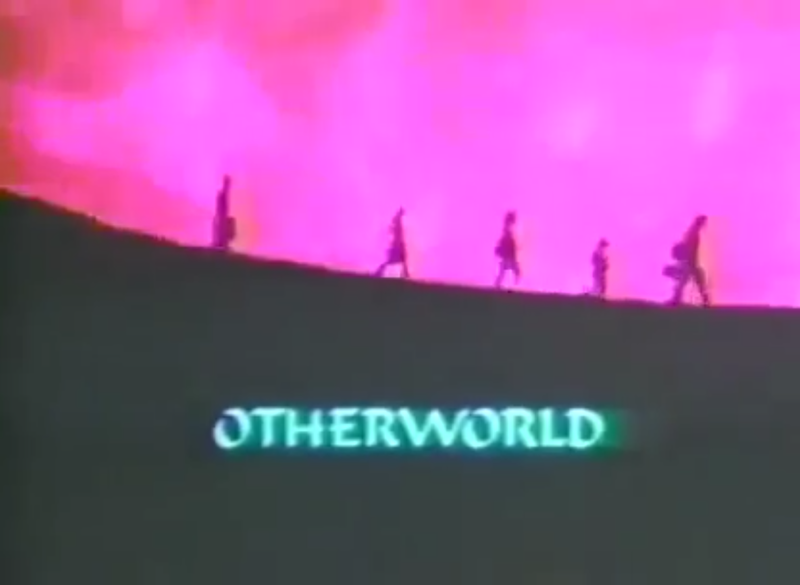 Originally debuting on CBS in 1985, Otherworld tells the tale of the Sterling family, who get lost in an alternate, dystopian world called Thel after being ditched in a pyramid by their tour guide during a once-in-10,000-years planetary alignment. Stranded in a world of androids, beastmen and authoritarian rule–how did they get there, and how can they get back? Given its short, 8-episode season, the odds are against them, but let’s find out. 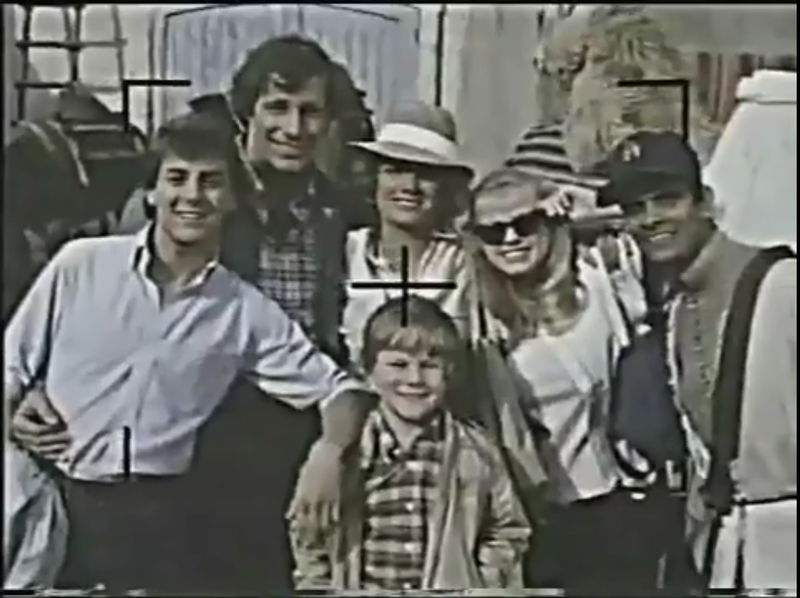 The Sterling family, clockwise from the left: Trace, Hal, June, Gina, the douche tour guide who sent them to the otherworld, and Smith. 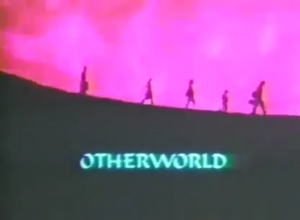 Otherworld is first and foremost a family show, in much the same vein as, say, Earth 2. The Sterling family, consisting of father Hal, mother June, daughter Gina, eldest son Trace, and youngster Smith, spend most of their time on the run from a “Zone Trooper” they accidentally confronted earlier on, Kommander Kroll, who turns out to be a rather important figure until his encounter with them and must capture them to reclaim his glory. Lucky for them, they’re able to steal his access crystal, which basically functions as a skeleton key for the entire framework of society that can’t be revoked, allowing them to establish pseudonyms and hide their movements. Of course, the family is terrible at this, with their unusual behavior often giving them a high profile in each place they settle down, only to return to walking the earth the next. 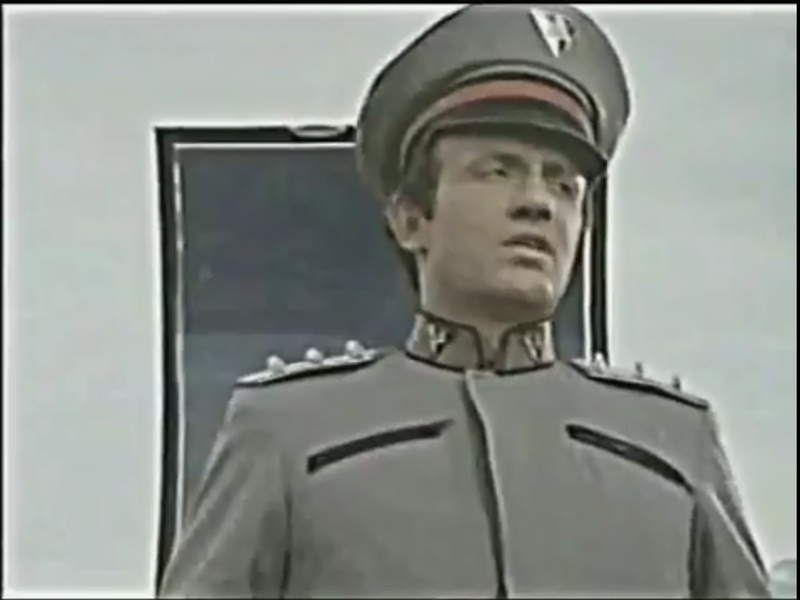 The show didn’t have much in the way of familiar faces, but Kroll is played by a young Jonathan Banks (Mike Ehrmantraut from Breaking Bad), Mark Lenard (Sarek from Star Trek TOS) shows up in the second episode as a drill sergeant-type character, Ray Walston (Boothby from TNG/Voyager) in the first, and Wayne Alexander (Lorien from Babylon 5, among many other roles) plays Kroll’s aide, Zero. The show seems to have a very interesting backstory and lore to it, but unfortunately it didn’t get very thoroughly explored. The nature of the relationship between Thel and Earth is much more complex than it appears initially, and the Sterlings aren’t the first to cross over. The family is surprisingly good. A lot of times in these “family” shows, you end up with either the kids being idiots and screwing things up for the adults, the adults being idiots and needing to be bailed out by the kids, or worse, everyone’s an idiot and it’s a wonder the family has survived at all. Otherworld seems to have struck a decent balance on this front–little brother Smith is used sparingly; Trace, while rebellious and unhappy with the situation, rarely does deliberately stupid things just to be contrarian; both parents are competent figures, and when the situation necessitates one or the other to take the lead, there’s little problem caused by that. Gina gets the least spotlight (although she gets the last episode), but doesn’t have any particular antagonistic dynamic for the most part. Compare this to a show like Terra Nova, where so little of the focus was on the new world because all the show’s attention was spent trying to follow Dumbass Jr.’s latest attempt at getting eaten by raptors. I certainly expected it to be a lot worse in an 80’s show, and was pleasantly surprised when it wasn’t. Even the less-than-impressive episodes have something to redeem themselves–for example, rather than Kroll always failing in a Team Rocket-esque manner, he’s often done in by his own negative attributes, such as in the otherwise lame “I am Woman, Hear me Roar,” when his sexism gets him thrown in jail and auctioned off, when he could have gotten his crystal back and captured the Sterlings if he’d only been more polite. acting and casting is so middle-of-the-road for its time it’s barely worth talking about. If you’ve watched other 80’s shows, you know what to expect. It’s not really a point in favor or against, it just is. 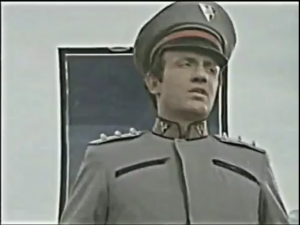 Kommander Kroll, quickly disgraced Zone Trooper. The effects work is atrocious. Even compared to rough contemporaries like season 1 TNG, it’s just no good at all, and it’s not like season 1 TNG is especially great at this stage, either. It’s too old for CGI, but that was of no help this time. The voice effect used for the beastman in “Mansion of the Beast” is so bad it renders him practically unintelligible. the capital city they’re seeking, Imar, is portrayed through stock shots of New York City that have been lazily edited to add a third World Trade Center building by duplicating the North tower. We have this crazy alternate world set up, and in the pilot episode introduce things like androids and the Church of AI, but then half of the episodes are set in what could easily be suburban America circa 1985, often rehashing plots that had no doubt already become cliche, like “stuffy church hates rock and roll” and “land where the patriarchy is REVERSED and men are subjugated!” (mentioned above). While several episodes do deal with or provide answers to questions such as why are they here and how can they get back, the show seemed far too willing to put those issues aside in order to retread generic, uninspired cookie cutter plots. Why were they even settled down and living in ordinary houses anyway? They had a journey to go on and a path to follow, but apparently that wasn’t enough to stop cliche, pedestrian stories from taking hold. Odds are high that it was a budgetary decision, but that doesn’t make them any less dull. Even the more sci-fi episodes don’t tend to be very novel. “Village of the Motorpigs” is rather Mad Max-ian, for example. The show had interesting pieces to work with but it never quite put them together to make something unique aside from the pilot. I would imagine this is also partly the effect of being a “family show.” What this often means is playing it safe, and that really cuts down what your options for stories are. Safe, after all, is just another word for boring. While the show doesn’t quite end on a cliffhanger, it’s clearly unfinished. Some major things are learned in the last episode which were pointing towards something significant coming by the end of the season, but as it is, that obviously never came to fruition. It’s also possible that, given the still-uncommon idea of the “Season finale” that it may not have been as near as it seemed, and had the show gotten 25 episodes the Sterlings would hardly be any closer than they were at the end of 8. The inklings of what we now call a series arc are definitely present, though, so perhaps they were more forward thinking than the rehashed episodes would lead you to believe. All told, Otherworld is just another in the long line of shows trying to appeal to all ages that ended up appealing to no one. Like many of these shows that appear in the Primer, it had some interesting ideas that it didn’t get to realize, but it doesn’t seem to have been a victim of meddling or any of the other common excuses. The show just didn’t do enough with its premise to capture an audience right off the bat. 2/5 UFOs: Some unrealized potential, but what’s there isn’t enough. A quick reminder of my rating system: a 5 represents must-see–a “hidden gem,” as it were. A 4 is good, solid television. A 3 is “cult classic” stage, where the show’s appeal is likely limited to a specific group. A 2 is flawed, but fun, or even “so bad it’s good,” depending on the series and its release timeframe. A 1, of course, is avoid at all costs. Otherworld is, unsurprisingly, not on the major streaming services, and the DVD had such a limited printing that it’s not even on Amazon. It is, however, currently posted to Youtube in exceptionally low quality (appears to be a VHS transfer from a reairing on the scifi channel, complete with screen overlays with annoying commentary for some episodes). I’ll leave it to you to find it there, should you choose to do so. Even though this was on CBS in the 80s I have absolutely zero recognition of it. I’ve never even come across the name before. That is seriously below the radar — no idea how you found it. The way you described each episode going through a one-off difference in their world (Mad Max, matriarchy, etc) and then returning to a regular “current” suburbs home almost makes it sound like Sliders without the sliding. The section about familiar faces was appreciated. It would also be of interest to learn if the crew behind the camera has done any major or successful sci-fi work as well. I looked this one up and the creators\writers have done various things but nothing that impressive. Some of the directors worked on a lot of good genre shows though. The trivia section on IMDB has unsourced reports that there were 13 episodes actually made even though just 8 were aired. I am guessing that the reason those missing 5 are not on the DVDs is because it was not an official release? Several of Syd Dutton’s matte paintings were later reused in the first season of Star Trek: The Next Generation. The average day on Thel is 25 hours long. The standard unit of currency on Thel is called the “Fon” and is roughly equivalent in value to a U.S. dollar in 1985. Those last two made me laugh since you mentioned earlier how the show didn’t go far enough in making the world truly ‘other’. It has been confirmed by stars of the show that only 8 episodes were shot, while there were a few more in preproduction and various stages of development. I’ll see what I can dig up on them, of course, but I’m skeptical there’s much to be found. Funny about the matte paintings; some of them did feel familiar. The last episode in particular is probably the one with the most recognizable painting. Would be interested on your take! Part of the difficulty with these (and why they became less frequent) is that I sometimes have a hard time actually finding a way to watch them. I’ve got a few shows that are practically becoming my white whales just out of how extremely rare they’ve turned out to be. It’s a real shame that so much TV has been lost to the sands of time, even with the internet here to catch it. But then, that was the motivation behind reviewing them all along. Kings was so good. Although I am not sure how sci-fi it is. At first I thought 2032 was some kind of SeaQuest spinoff, but I guess that it has an alternate title? I had only heard of DSV. I believe it’s just an alternate name for the final season.